The 1987 season began with Newcastle continuing to race in the 2 Northern League divisions (renamed Divisions 1 and 2). 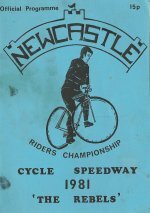 One absentee was Stuart Craig, for many years a top Newcastle rider, who retired from the sport. 8 teams came to the tapes to contest the title, with teams from the Manchester region expected to dominate. Teams consist of 8 riders, the top 6 have 5 rides, the 2 reserves have 3 programmed rides, but can have up to 2 extra replacement rides. In Division 2, teams consist of 6 riders having 4 rides. There is a nominated heat where 2 riders have an extra ride. Up to 2 extra riders can be named, they have no programmed rides, but can replace a team member. The number of rides is shown for a rider in brackets, if that rider has a different number of rides than programmed. Maximum points (3,4 or 5 rides) are underlined. Penalty points are surrendered by a team who uses a rider(s), in Division 2 who has already ridden in the Division 1 match. Their points scored (including bonus points) are added to the opposition score. Riders involved are shown in red. 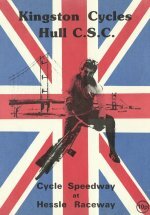 The season opened with a home league match against Hull. A great start saw two excellent wins. 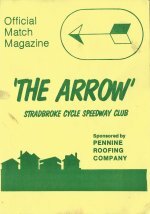 The division 1 team had 4 unbeaten riders including both reserves. M Parr 19+1, G Parr 16+2, B Mills 16(4), P Marshall 15+1 (4), J Wilson 14+2, J Keith 13+3 (4), A Murray 13+2 (4), D Lamming 8. P Schofield 12+1, A Schofield 12, A Craven 11, M Parker 7+1, J Baker 7+1, J Murphy 7 (4), R Pawson 7 (4), H Middleton 3 (3). M Parr 18+2 (5), G Parr 18+2 (5), A Crawford 12+4, T Kirkup 11+1, A Patterson 11, D Baxter 10. M Parker 11, J Baker 9+1, A Richardson 8+2 (5), R Baker 8, R Jeffries 8(5), H Middleton 4. Back to reality as the ultra strong Manchester team steamrollered the visitors. 4 shared heats was the best Newcastle managed, with Michael Parr getting the single heat win. In the Division 2 match the opposite happened. Despite giving away 17 penalty points, Newcastle easily overcame the home team. Gavin Parr topped the scorechart with a superb 20 point maximum and he had plenty of solid back-up. L Bowden 18+2, D Garnett 17+3, J Burke 15+2, J Weaver 15+1 (4), P Serbert 15+1 (4) S Davidson 14+5, J Higham 13+2 (4), J Whiting 13 (4). M Parr 11, A Murray 9, G Parr 9, B Mills 8+1, J Wilson 8, P Marshall 7, J Keith 4+1 (3), D Lamming 4 (3). 49+17- 66 D Salthouse 14 (5), G Hollingsworth 9, G Gleave 8+1 (5), P Keen 8, P Sellers 6, D Sellers 4. G Parr 20 (5), J Keith 16+3 (5), A Crawford 13, D Lamming 12+2, A Patterson 10+2, T Kirkup 9+2. Chesham were next to visit and came away with the points after a close encounter. Newcastle were leading by a point with 3 heats to go, but went down by 6 points. Things could have been different had Michael Parr not crashed in his fourth ride, after wining is first three, and missing his last. Steve Jones was unbeaten for the visitors. In the Division 2 match the home team raced to nine 7-3s, and dropped just 4 points in the entire match. Newcastle gave a debut to Edinburgh based Dave Baxter. J Wilson 17+1, B Mills 15+1, A Murray 12+2, M Parr 12 (4), P Marshall 9+1 (4), J Keith 9, G Parr 7+1, D Lamming 4+1 (3). S Jones 19+1, P Graham 14+2, S Mills 14+1, D Kilroy 13, M Hack 12+2, S Mann 9+1 F Morris 7(4), M Graham 3 (2). A Crawford 20 (5), G Parr 16+4 (5), A Patterson 15+1, D Baxter 14, T Kirkup13+3, M Jacques 9+1. S Yarwood 11(5), S Hamer 10(5), S Nountaine 7, M Graham 6, R Bedson 5, J Rand 4. The following week saw Newcastle at home again, this time they had a much easier time beating Sheffield by 38 points. 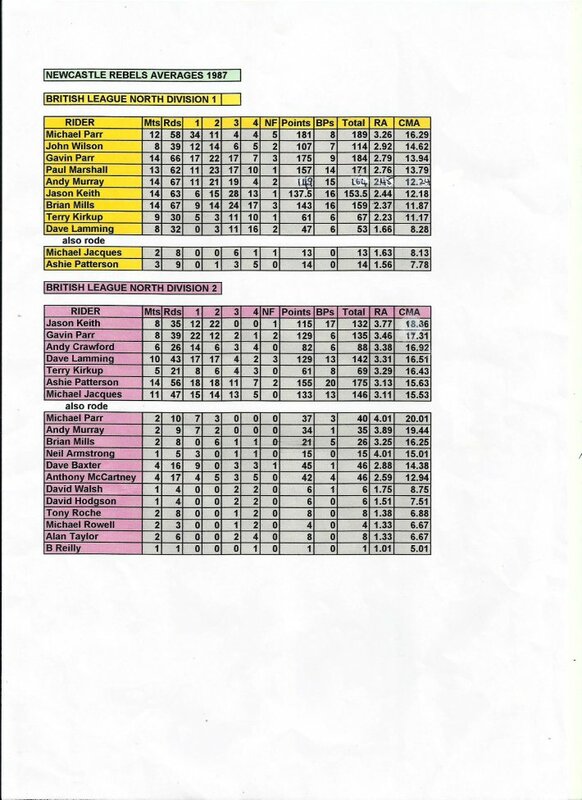 Michael Parr led the way with a 20 point maximum, Paul Marshall was also undefeated from reserve. The rest of the team all scored highly. Stiff opposition came from Chris Turner with 19 for the visitors. M Parr 20, A Murray 14+3, P Marshall 14+2(4), B Mills 14+1, J Wilson 13+3, G Parr 13, T Kirkup 10+1 (3), J Keith 9+ (4). C Turner 19, M Gamble 14, G Stringer 13, M Knowles 6(4), A Dalton 5(4), P Shale 5(4), S Cadman 4, A Knowles 3(3). D Baxter 16, A Crawford 16, J Keith 15+5(5), D Lamming 15+3(5), M Jacques13, A Patterson 10+2. P Shale 12(5), I Willoughby 11(5), J Wright 7, D Dalton 6, P Fretwell 4, M Shepherd 4. Newcastle headed to Stockport confident of victory against the weakest of the Manchester sides, and so it proved as a strong team performance saw them return to the north east with a 23 point win. Highlight was another maximum from Michael Parr. 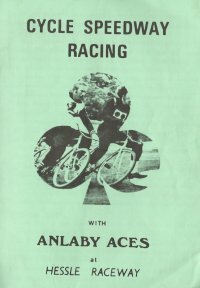 For the home team Frank Finnegan was beaten by Parr in his first ride, but took 4 wins to finish with 19. The Division 2 side had another large win despite giving away 18 penalty points. Kirkup and Keith were unbeaten, everyone managed double figures. F Finnegan 19, T Norman 14, L Phillips 9, R Hayes 8+2, D Cragg 8+1, D Morgan 8(4), L Heath 7(3), M Williams 5(4). M Parr 20, G Parr 15+2, J Wilson 15(4), B Mills 13+2, A Murray 13+2, P Marshall 10+1, J Keith 9+1(4), T Kirkup 6(3). R Williams 14(5), P Williams 1(5), L Cooper 7, B Wheatley 5, M Lea 5, J Lloyd 3(2), B Carris 2(2), S Ward 1(1). J Keith 18+2(5), T Kirkup 16, M Jacques 13+3(5), A Patterson 13+1, A Crawford 12+2, D Lamming 10. 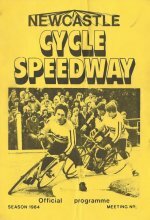 17 May 1987 NEWCASTLE 71 MANCHESTER 104 Knockout Cup 2nd round. It was the turn of the Knockout Cup next. Although Newcastle had a home draw, unfortunately it was against the near invincible Manchester side. Also, John Wilson was missing, work taking him to the Stockport area, although he would return later in the season. As expected the away team took a commanding win, John Higham and Les Bowden were unbeaten. 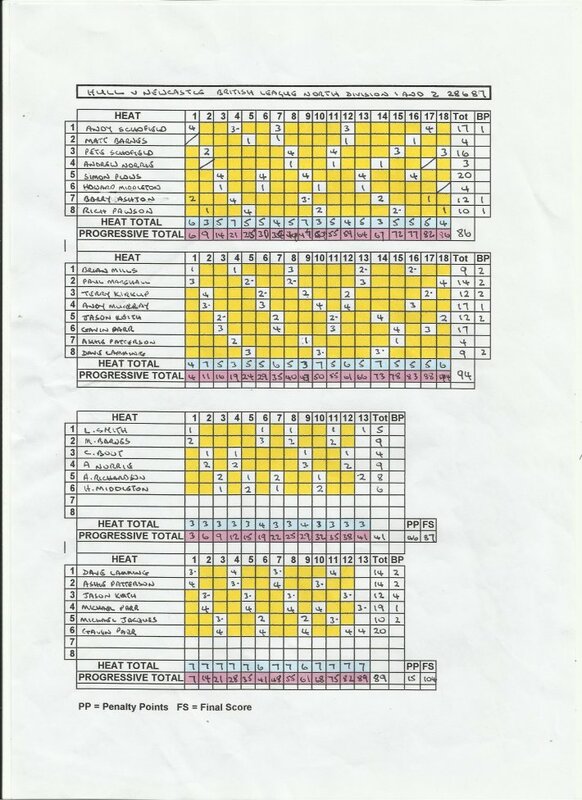 Newcastle managed only 2 heat winners, and failed to provide a finisher in the last heat. G Parr 12, J Keith 11, B Mills 10+3, M Parr 10, P Marshall 8, A Murray 7+2, A Crawford 7(3), D Lamming 6+1(3). J Higham 17+3, L Bowden 17+3, P Serbert 17+2, D Garnett 17, S Davidson 15+1, J Burke 13+2, G Gleave 5(3),P Keen 3 (3). Newcastle found the Tameside team too strong when they visited the Manchester track going down by 33 points. At the half way stage they trailed by only 8 points, but fell apart later in the match. Pete Young starred for the home team with 20 points. Newcastle's' problem was finding a heat winner. In fact only Gavin Parr managed it after both Tameside's riders had fallen. Our Division 2 team suffered their first defeat of the season, losing quite heavily on the track as well as giving away 16 penalty points. However, it turned out to be the best performance of the season as Tameside remained unbeaten all season. P Young 20, A Bickerdike 17+3, R Farrell 17+1, P Ogden 16+2, B Eaton 15+1, G Dent 10+1(4), D Artingstall 7(4), A Chadwick 2(3). M Parr 11+1, A Murray 11+1, P Marshall 11, G Parr 9, B Mills 8+2, D Lamming 8+1, T Kirkup 7+1, J Keith 6+1. J Burgess 8(3), T Faulkener 3(3). 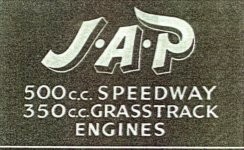 J Keith 15, G Parr 14(5), A Crawford 9(5), M Jacques 6, A Patterson 6, D Baxter 5+1. This was by far the worst performance of the season. Still without John Wilson and Michael Parr, Terry Kirkup and Paul Marshall were also missing, but this could not hide what happened. Heckmondwike claimed maximum points in 14 races. Newcastle with only 7 riders failed to provide 2 finishers in 5 races and had no heat winners. Of course the away team scored as they liked, 5 riders remained unbeaten. It could have been worse had Steve Blair not finished in one race. There was further disappointment in the Division 2 match when Newcastle could only provide 5 riders and gave away massive 44 penalty points. Even with 39 penalties of their own they went down by 11 points. G Parr 11, J Keith 9, A Patterson 8(4), M Jacques 8, B Mills 5, A Murray 5, D Lamming 5. A Whitworth 11+1(3), M Rusby 10+2(3). G Parr 17(5), M Jacques 13+2(5), J Keith 11, D Lamming 10+1, A Patterson 8+2. S Blair 16, N Teale 11, A Whitworth 10+3, P Beacock 10+1(5), M Rusby 9+2, D Wainwright 9(5). Newcastle bounced back from their Heckmondwike humiliation when they traveled to Humberside and won an exciting meeting against Hull. Hull's heat leaders were on form with Simon Plows unbeaten, but Newcastle provided a solid scoring unit, even without top man Michael Parr. S Plows 20, A Schofield 17+1, P Schofield 16, B Ashton 12+1, R Pawson 10+1, M Barnes 4(4), H Middleton 4(4), A Norrie 3(3). A Murray 17+1, G Parr 17, P Marshall 14+2, T Kirkup 12+2, J Keith 12+2, D Lamming 9(3), B Mills 9+2, A Patterson 4(3). M Barnes 9, A Norrie 9, A Richardson 8(5), H Middleton 6, L Smith 5(5), C Boot 4. G Parr 20(5), M Parr 19+1(5), D Lamming 14+2, A Patterson 14+2, J Keith 12+4, M Jacques 10+2. Penalty points were order of the the day in Division 2, however, Newcastle just managed to come out on top thanks to a last heat 7-3 from Murray and Kirkup. G Parr 14+1, A Murray 10+1, J Keith 10+1, P Marshall 10+1 M Parr 9+1(4), B Mills 8+1 T Kirkup 7(4), D Lamming 3(3). D Garnett 19+1, L Bowden 17+3, P Serbert 17+3, J Higham 15, S Davidson 14+3, J Weaver 10, C Hemmings 7(3), D Salthouse 6(3). A Murray 18+1(5), J Keith 15, T Kirkup 12+2(5), A Patterson 10+2, G Parr 9+1, D Lamming 8+2. J Weaver 16, D Garnett 12,D Salthouse 11(5), G Gleave 7, P Keen 5+1(4), G Hollingsworth 5+1. Newcastle had no joy again on their visit to Chesham. 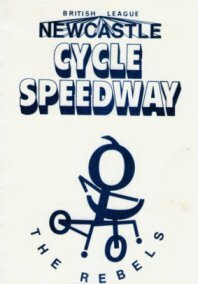 The match was quite tight until heat 10, when rider/team manager, *Terry Kirkup was involved in an incident with the referee after being excluded. This led to a match ban for Kirkup, and with it Newcastle's chance of taking anything from the meeting. Many of the team were not competitive for their remaining rides. Mick Parr however made light of the situation to record a 20 point maximum. In Division 2 Newcastle made amends against a young Chesham side and hammered 12 7-3s out of 13. Missing out were Lamming and Patterson who filled the minor positions behind Steve Cowgill. M Hack 18+1, P Graham 16+1, G Bailey 13+1(4), D Kilroy 10+3, F Morris 10+2, S Mann 10+1(4), S Yarwood 9(4), M Graham 8+1(4). M Parr 20, G Parr 15(4), J Keith 13, P Marshall 12+2, A Murray 10+1, B Mills 8 T Kirkup 2(3)*, A Patterson 2(3). *Match ban. S Hamer 7, B O'Shaughnessy 6, S Hardman 6, S Cowgill 5, K Kay 5(3), M Dotson 4(3), M Woolsoncroft 3(2), D Trippier 3(2). M Jacques 20(5), D Lamming 17+2(5), A Murray 16, J Keith 13+3, B Mills 12+4, A Patterson 11+4. An away meeting at Sheffield was next for Newcastle, and a first heat 7-3 from the Parr brothers was the just the start they wanted. Newcastle welcomed John Wilson back, his work allowed him to return to the north-east. A solid performance saw the lead extended, and a 21 point victory was the result. Only three points were dropped by the Parrs, and Paul Marshall scored strongly. Brian Mills was the surprise, in his 4 rides he remained unbeaten. No-one, however could match Martin Gamble, the home man scored 20. There were three debuts in the Division 2 clash.. Anthony McCartney and Neil Armstrong scored 15 points each in another massive victory for the second team. Patterson, Jacques and Lamming were unbeaten. It was good to see no penalty points for both teams. M Gamble 20, C Turner 17, P Shale 10+2, S Perkington 10, A Dalton 6, L Oldroyd 4, S Flanaghan 4. M Parr 17+2, G Parr 16+2, P Marshall 16+1, B Mills 14+2(4), J Wilson 13, J Keith 10+1, A Murray 7+1(4), M Jacques 5+1(3). M Cooper 10(5), P Povey 9+1, P Ashton 9, J Knight 8, M Ashton 6+1(3), L Ashton 6+1, J Perry 3(3). D Lamming 16, A McCartney 15(5), N Armstrong 15(5), M Jacques 14+2, A Patterson 13+3, A Taylor 6. After two away meetings, Newcastle returned to home shale with Stockport as visitors. It proved to be one way traffic as the home side gained twelve 7-3s and two 6-4s, Stockport could do no better tan to share the rest of the heats. Surprisingly only Gavin Parr and Andy Murray from four rides at reserve remained unbeaten. Terry Norman and Dave Cragg shared three heat wins for Stockport. 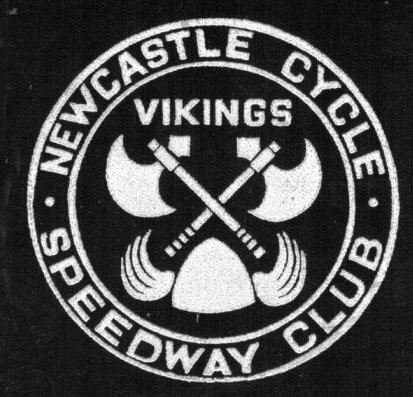 In Division 2, Newcastle gave debuts to three more riders. On the track, the three Newcastle heat leaders did well, although Dave Lamming failed to finish in his first two rides. the final score was was a win for Stockport by four points, however, they forfeited 24 penalty points, and the home team were winners by 20 points. G Parr 19+1, J Wilson 18+1, J Keith 16+2, P Marshall 15+3, M Parr 15+2, A Murray, 15+1(4), B Mills 11+3(4), T Kirkup 7+2(3). T Norman 15, D Cragg 13, M Lea 7+1, P Williams 7(4), R Williams 6, B Wheatley 6(4), G Johnson 5, K Geddes 3(3). R Williams 14+1, K Geddes11+1, M Lea 11, J Lloyd 10+4(5), B Wheatley 10+1, S Ward 10+1(5). It was a home meeting again, but a much different result. Newcastle went into the meeting without John Wilson and had Terry Kirkup withdrawing after one ride. They managed to lead by one point after four races, but Tamesides' strength pulled them through to an eventual 16 point win Pete Young was unbeaten and Brian Eaton dropped just one point. Andy Murray and Mick Parr led the way for the home side. A Murray 16, M Parr 15+1, P Marshall 13, G Parr 12, B Mills 10+1, J Keith 8+1, D Lamming 6+2, T Kirkup1(1). P Young 20, B Eaton 16+3, A Bickerdike 15+1, M Hammersley 13, M Mulvey 12+2(4), D Kenyon 9+1(3), S Pearce 7, T Faulkener 5(4). G Parr 14(5), B Mills 9+1, A McCartney 8+1, M Jacques 8, T Roche 8(5), A Patterson 4. M Mulvey 20, S Smith 15, D Kenyon 13+3, S Pearce 12+1, A Taylor 10+2, T Faulkener 8. Newcastle went to Heckmondwike for their final league match of the season not realising what lay ahead. Tempers were lost in an explosive meeting that led the visitors to finish the meeting under protest in what they felt was dangerous riding from the home team and debatable refereeing decisions. Non finishers in the first six heats were Mick Parr, Murray and Mills. In heat 7 Gavin Parr sustained injury and was forced to pull out. This was too much for Newcastle and as a spectacle the meeting was all but over. The records show Heckmondwike won by a massive margin, but not the story behind it. To add insult to injury, there was a dead heat, the statistician's nightmare. In contrast there was an exciting Division 2 meeting. Both teams supplied eight different riders. Newcastle had the meeting won by the nominated race, Heckmondwike gained a 7-3 against two Newcastle newcomers, to lose the meeting by just two points. For the visitors, Patterson, Lamming and Jacques were unbeaten. S Blair 19+1, I Clark 16+3, M Kent 16+2, M Webster 14+1(4), P Beacock 12.5, D Kent 12, D Baugh 11+3(4), M Cockroft 10+1(3). M Parr 12, P Marshall 11, J Keith 9.5, J Wilson 9, T Kirkup 9, A Murray 7, B Mills 4, G Parr 2(2). S Carter 11+1, N Johnson 10+2, C Byron 10, J Conquest 9+1(3), I Johnson 9(3), I Hutchinson 7+2(3), D Ellam 4+1(2), M Richardson 4+1(3). D Lamming 16, A Patterson 15+1, M Jacques 11+1(3), A McCartney 9, D Walsh 6+1, M Rowell 3(2), D Hodgson 3(2), T Roche 3(3). The final team outing of the year saw the annual Inter-City trophy meeting take place at Hull. Newcastle were weakened due to the absence of Murray, Mills and Gavin Parr. Hull had the meeting won by heat 17, a final 7-3 for Newcastle closed the gap to 6 points. Andy Schofield and Simon Plows dropped a point each for Hull, who had the match winner with Rich Pawson at no.8. Michael Parr, Wison and Keith were best for the Rebels. In the Combination challenge that followed, Newcastle ran out easy winners by 12 points. A Schofield 19, S Plows 18+1, P Schofield 15+1, S Plows 15, D Armstrong 12+3, ARichardson 5(4), H Middleton 4+1(3), A Norrie 4(4). M Parr 18, J Wilson 17, J Keith 16, T Kirkup 11+3, D Lamming 9+2, P Marshall 7+2, A McCartney 5, A Patterson 4. M Cagney 11+2(5), C Boot 10(3), L Smith 10, H Middleton 9+1, W Stubbs 7+1(5), H McLaughlin 6+1, A Richardson 6(2). D Walsh 17+2(5), A McCartney 16+1(5), A Patterson 14+1, D Lamming 11, J Keith 9+1, T Kirkup 4. The biggest ever meeting held in Newcastle took place on 5th September when a British League Test Match was staged between The North and The South West. Mick Parr and Andy Murray were picked for the North team, but they and their team mates could do little as the South West powered to an impressive 43 point victory. The North could only provide two heat winners through Pete Young (Tameside) and Steve Jones (Chesham), while the South West all scored freely, strangely only Mark Reed was unbeaten. Pete Young 14+1, Steve Jones 11, Simon Plows 10, Frank Finnegan 8(4), Michael Parr 7+1, Andy Murray 7, Andy Schofield 6(4), John Murphy 5+1. Mark Reed 16+4, Colin Simmons 19, Steve Paver 15+1, Steve Harris 14+1(4), Martyn Hepworth 13+2(4), Andy Barnes 13+2(4), Mark Collins 12, Dave Murphy 9(4). Gavin Parr made two appearances for Young England against Young Australia, scoring 15 out of 16 at Sheffield and was unbeaten at Heckmondwike. He also rode in the British League (North) Junior Individual Championship at Tameside. He started with 3 wins, but unfortunately fell in his last two rides. Mick Parr rode for the North team in a test match against the South East that took place at Thurrock. the North team were well beaten, but Mick managed to get one of their only heat wins in scoring 10+1 from five rides. 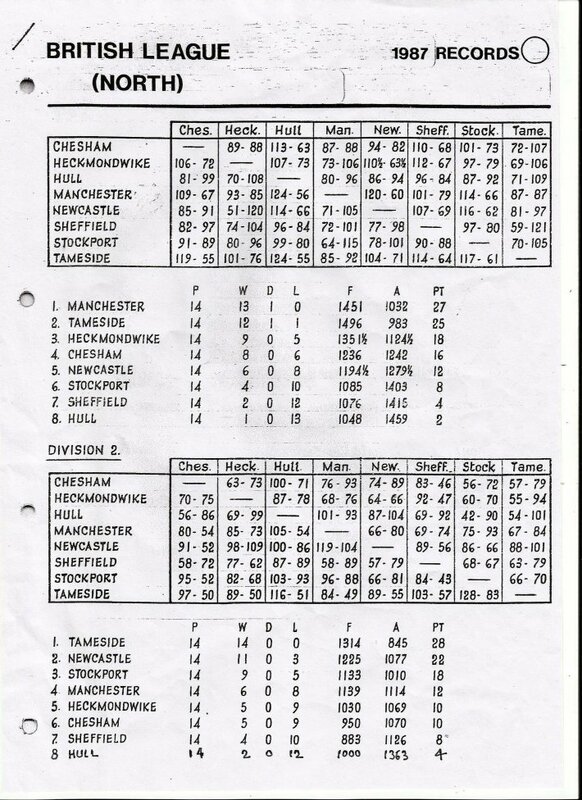 On the 9th of August 1987, Newcastle took part in the League 4s championship at Stockport. In their qualifying round they came second to Stockport A to go through to the semi-finals. It was a tough semi as they found themselves against Tameside A and Manchester A who qualified. However it was a fighting performance coming third only five points adrift. Newcastle 43 Mick Parr 14(4), Andy Murray 9(3), John Wilson 7(3), Gavin Parr 7(3), Brian Mills 6(3).